Author of Bartleby & Co.
Eduardo Lago, Call Me Brooklyn. ; Enrique Vila-Matas, Desde la ciudad nerviosa (Textos de escritor) (Spanish Edition). Enrique Vila-Matas, El viaje vertical. 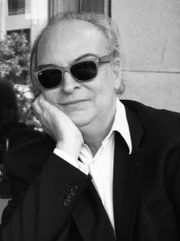 Enrique Vila-Matas is currently considered a "single author." If one or more works are by a distinct, homonymous authors, go ahead and split the author. Enrique Vila-Matas is composed of 9 names. You can examine and separate out names.